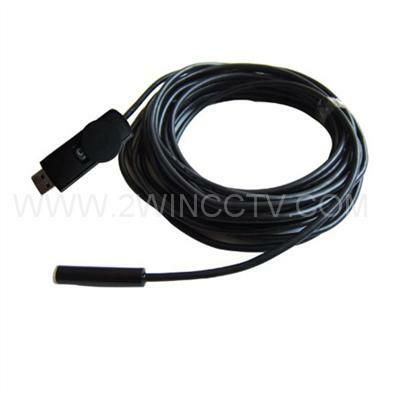 Home Borescope/Endoscope is a new electronic health care product for home, a household necessity. The main advantages are small in size—the diameter is only 10 mm, high resolution imaging, waterproof and a simple magnifier. You can display the images captured by the home borescope on the computer screen, store them, print them, or send them over the Internet. As an endoscope, you can use it to observe yourself like using a mirror. You can observe any part of your body, which are hard to see , such as the back, the head, the inside of the mouth, the tooth, and even the throat. Frequently check and Cherish your health. If it is good, preserve it. If it is unstable, improve it. beyond what you can improve, go to a doctor early, it is quite helpful for the health of your family. Intraoral Camera system: underwater camera; waterproof Micro-cameras; motor vehicle detector; sewer pipeline detector; search and rescue seeker; criminal and custom detector; archaeological detect; the PCB detection; home care; aviation and space industries; cars and tractors industries; petroleum drilling industries; constructions and so on. Connecting computer: Use USB cable to connect the computer. LED lighting adjustable: you can turn the wheel (see illustration above) to adjust brightness to achieve a clear picture. Take photos: first you should find “Rscapl.10”in CD, double click it. And then find “File”in the upper left corner of the video window, now open the drop-down list to Select the path to store the photos and type the filename, now you can press the snap shot button(see illustration above) to take photos, one by one. It will save automatically. Video recording：Start the software “Rscapl.10” in the CD， find “Capture ”menu on the top of the video window. then open the drop-down list to Select "Start Capture ” to start video recording. And you can select “"Stop Capture” to stop video recording. video recording will have the same store path as pictures. Hook, Magnet, Mirror: with it , you can observe the parts that u cannot see before, such as the clinks in the wall, the parts under the beds, the magnet and the hook will help you getting your small things such as the key out from under the beds. The camera is waterproof, so it can get into the water to see, find your things in water , take photo of the fish swimming and eating.